Situated in Amesbury, in scenic Wiltshire, George Hotel is a 5-minute drive from Stonehenge. The historical hotel was built in the 13th-century, and features a traditional restaurant and ale bar. Rooms at The George have private bathrooms and tea/coffee facilities. Rooms also have a multi-channel TV, and many have wonderful original features. The cosy bar has exposed oak beams and open fires, and offers a range of real ales and snacks. The restaurant serves classic English cuisine, hearty breakfasts and traditional carvery lunches. There is also a Sports Bar, featuring Sky Sports, a pool table and darts.Wi-Fi is accessible throughout the hotel, and free parking is available on site. 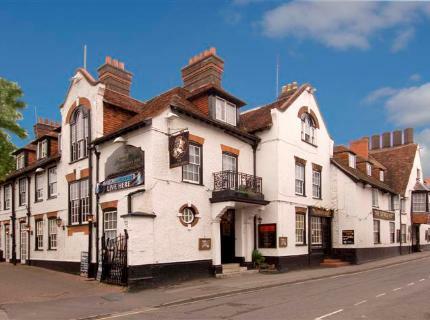 Located just off the A303 road, The George Hotel is a 15-minute drive from historical Salisbury. Old Sarum Hill is a 10-minute drive away.